A quarter of Brits have refused to get in the car with their partner in the past year because they fear for their own safety. 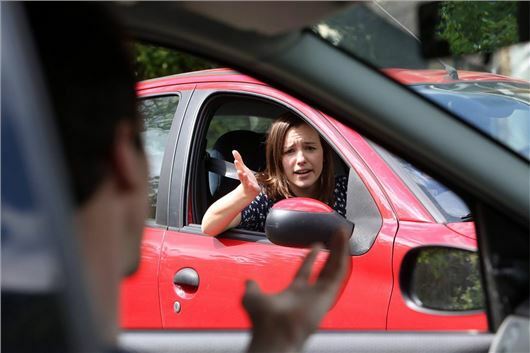 Taking too long to pull out of a junction, driving in the wrong gear, road rage and driving too fast are some of the most common complaints drivers make about their partners. But the issues men and women have with each other's driving are starkly different. While female drivers insist their other half drives too quickly on country roads, tailgates other drivers and is prone to braking too late, men complain that their partner drives too slowly and lacks confidence when overtaking. In fact, the average couple tend to start arguing just 28 minutes into a car journey, with 69 per cent of the 2000 motorists surveyed by Budget Insurance saying car journeys always end up in a row. One in ten say they are most likely to fly off the handle at their nearest and dearest on the way to the supermarket. Travelling on unfamiliar roads and journeys of more than two hours are two of the most common moments for a falling out over driving habits. The report shows that men still do the majority of the driving (84 per cent) while just 29 percent of women will drive on a long journey. Overall, 21 per cent of drivers surveyed claim they hate the way their other half drives, with four in 10 regularly shouting at their other half about bad driving habits. A quarter of the drivers that were asked said they routinely refuse to even get in the car with their partner because of their driving habits. Three out of four men say they are better at driving than their partner, compared to just 43 percent of women who say they are far better behind the wheel. 13 percent said they had even been forced to grab the wheel while their partner is driving to avoid a crash or a bump.